With the popularity of beards among millennials, you might think that young men today invented the beard. 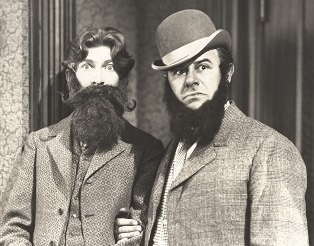 But the ability to grow facial hair has long inspired men to express their personality and masculinity in unique and interesting ways. In Ancient Egypt royalty — kings and queens — tied a beard made of metal over their heads to impress their followers. Some Ancient Egyptians dyed their chin beards reddish brown or brown. In Ancient Greece, beards were worn as a sign of honor, with some men curling their beards with tongs. If you wanted to punish a man, you would cut off his beard. But around 345 BC Alexander the Great ordered his soldiers to shave off their beards to prevent enemies from grabbing on to them during battle. In Ancient Rome, well-groomed and trimmed was the style. Around this time the use of razors were encouraged and Greek Sicilian barbers opened up shop in Rome. If you were a philosopher, though, you would keep your beard as a sign of your deep thoughtfulness. Before Christianity reached England, pagan men wore beards. Early Christian clergy in the country, though, had to shave. Later, William the First ordered English princes to shave off their mustaches and beards. With the Crusades, beards came back into fashion. After that, men moved through many styles of facial hair, sometimes opting for the clean-shaven look. During the 14th to the 17th centuries, beards were not just a fashion statement, they were a rite of passage. Look at any portrait and you’ll find men sporting a wide range of facial hair styles, from a pointy beard to a mustache-goatee combo named after 17th-century Flemish painter Anthony van Dyck. As society became more prosperous and polite during the 18th century, beards fell out of fashion. Educated men now shaved their faces — the smooth look was also a sign of having an open mind. Around this time, new shaving technology helped men shave regularly. Cast steel allowed manufacturers to make blades that lasted longer, which meant more comfortable shaves. There was also an explosion of shaving accessories — strops to keep the razor sharp, shaving powders, face creams and various scents. The preference for smooth skin didn’t last forever. By the mid-nineteenth century, a love for beards and mustaches blossomed. This may have been spurred in part by the mustaches worn by British soldiers. But the rise of explorers played a role, too — it’s impossible to shave in the middle of the wilderness, so full beards became associated with manly ruggedness. And once again, the masculine and virile reputation of beards returned. Some people even thought facial hair could keep diseases from reaching the face and mouth — a mighty beard, indeed! From the start of the 1900s, beard fashions — like other style trends — changed rapidly. Mustaches were popular in the 10s and 20s. In the 40s and 50s men preferred the clean-shaven look, although the beatniks and some jazz musicians — like Dizzy Gillespie — popularized the goatee in the 40s. In the 1960s, clean-shaven was still popular, but beards continued to make inroads into culture. The goatees of the counterculture groups stuck around, but the scruffy beard also began to show up more often. These beard styles were often worn by creative people like artists, writers and filmmakers. As the hippie culture and disco picked up, full beards returned in force. Men had more styles to choose from, shaping their beard to their own personality. The bushy beard remained popular to some extent during this time, but mustaches reigned supreme during the 70s. With the 80s, it was back to baby smooth skin, coinciding with the rise in corporate culture and a more conservative attitude in politics. A few men, though, still dared to wear a distinctive mustache — like Tom Selleck in Magnum P.I. By the 90s and the early 2000s, goatees and the soul patch had returned in full force, propelled partly by the popularity of alternative bands. Some men wore a scruffy beard-goatee hybrid. Others, like Brad Pitt, wore their goatee extra shaggy. In recent years, Millennials have embraced the beard, although in a mix of styles. For a while, the lumberjack beard — sported alongside matching plaid shirts — was in vogue. Plaid is now out, and men are breaking new ground with the ultimate expression of facial hair: the beard-and-man-bun combo.